I often take children on treasure hunts through garden or woods. We search for what's in season, what's unusual, cool, or beautiful. We admire, photograph, sketch or gather, depending on where we are. We make fairy houses and other wondrous crafts with pods, cones, dropped leaves and petals. January 26th at the Brooklyn Botanic Garden, I was on my own, no child in tow. 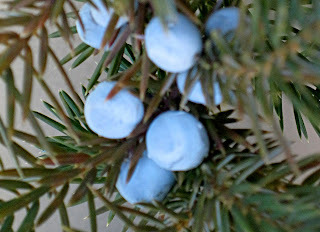 In the 'dead' of winter I wanted to find what was most alive and most appealing outdoors. Here are some treasures I discovered in just a tiny part of the BBG, on the walk from the #2 train to a meeting in the auditorium. I swear I've never seen Paper bush before (Edgeworthia chrysantha, top image) but this shrub gathered a crowd of admirers, all gardening professionals. The "American Hort. 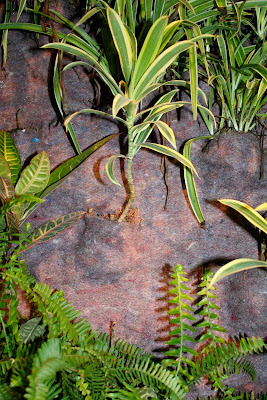 Society Encyclopedia of Plants" shows pictures of this species with yellow flowers. So these must be the buds. Fattening up too are the buds of the Star Magnolia, one of the first to bloom in spring. Their flowers are often blackened by late frost so never a favorite in my own gardens. Last Fall's fruit still looking attractive are yellow and red-berried hollies. to check the ID tag). 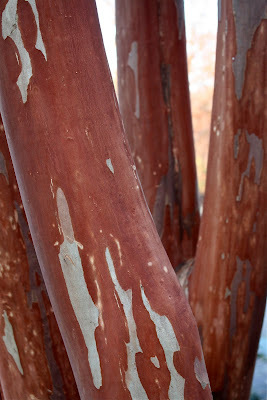 Without the distraction of flowers, I found lots of bark treasures, in particular two varieties of Crape-myrtle. The bark is so smooth it seems like a sanding machine has just completed its work. Whenever I'm in a special garden I'm looking for stuff that I can plant at home. 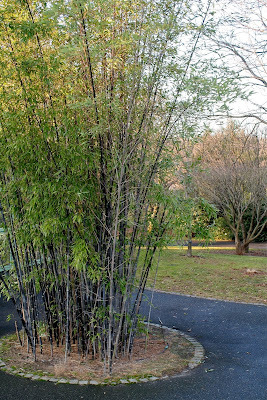 One of the great treasures found on this hunt is a stand of Black Bamboo (Phyllostchys nigra), so called because of the shiny black stems of the mature plant. I actually do use it on my roof garden in a 30" pot. It's very successful for its conditions but will never compare to this magnificent specimen. Note how it's planted at the BBG isolated by a swath of driveway. Someone must have measured the longest possible root creep and decided it's safe. On Dec. 14th, 2009 I announced my Big Apple Roof Awards for 2009 in this blog. Now my pick for least favorite: the roof garden at the Museum of Modern Art, New York City. What, you didn’t even know MOMA has a roof garden? You’ve been to the Museum many times and never seen mention of it? You are a great fan of the MOMA sculpture garden and would love to see the roof? Well you can’t. Not even if you pay admission. This “garden” is meant to be seen from neighboring windows, those that are higher than the 10th floor, so if you rent a room at the Warwick Hotel facing 54th St. or have an apartment at the Museum towers, or an office overlooking the Taniguchi building, you’ll be able to see the plastic boxwood-like things in all their glory. Oh yes, there are stones in patterns and some rocks too. Apparently MOMA didn’t want anyone to be able to walk out on the “garden”, didn’t want any water leaking on the art work on floors below, didn’t want any upkeep costs. MOMA did want to placate neighbors who questioned expansion of the Museum. But if they really wanted to be a good neighbor, why would they leave their trash pile exposed on 54th St. for all of those neighbors to see every day. This “garden” has been cited by the American Society of Landscape Architects with an Honor Award. The project statement refers to its ‘wit and irony’. Where they see wit, I see humorless, fake; where they see ‘irony’ I see insult and missed opportunity. I woke up this morning realizing that this design reminded me of the miniature golf courses of my girlhood.The ASLN award compares the MOMA rooftop to Japanese dry Zen gardens. 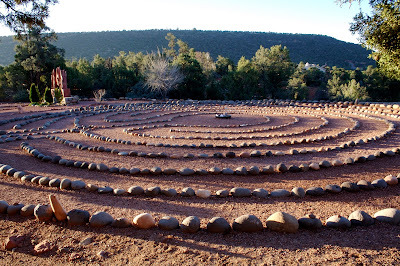 I’ve been to many Zen gardens both in the US and Japan, and find them invariably delightful, serene places to stroll, contemplate, or enjoy from afar. Thinking of what MOMA might have done and didn’t, makes my blood boil. Before I saw the roof I called on all of my scientific training to wait until I saw it myself. I was trying so hard to keep an open mind. Go see for yourself, provided you have a friend or acquaintance on a high floor overlooking 54th St. Don’t expect to be able to look just by paying your $20 admission to MOMA. Many thanks to dear friend Leah G. who gave me access to her building’s roof for my viewing and telephoto lens. Who's a real New Yorker? When I moved here from Pennsylvania, I was advised not to call myself a New Yorker until I had survived the city for 7 years. But I discovered two more meaningful criteria. 1. When, deciding to go car-less, I sold my Jeep with its Meadow Lark Flower & Herb Farm logo. 2. When I fully accepted mailorder gardening as a feature, not a bug, of living in the city. On my farm, I had used my Jeep and GMC panel truck to haul bags of fertilizer, trees and shrubs, flats of herbs and annuals, and even as modified cold frames in emergencies. I had ordered specialty seeds for the hundreds of varieties I grew for drying (Nigella orientalis anyone?) ordered bulbs so I could get the exact shade and timing I required, but everything else I trucked from nurseries as much as 90 miles away. 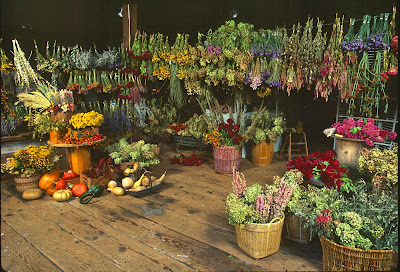 Below, the interior of my barn with dried harvest. ©Alan & Linda Detrick, Ellen Spector Platt design, all rights reserved. Now in Manhattan, too cheap to rent a truck, and not wanting to rely totally on the kindness of Other Ellen to buy things for me, I expanded my use of long distance ordering. From Klehm's I bought the lovely native wisteria 'Amethyst Falls' (above), three varieties of clematis and two peonies. Well-Sweep Herb Farm had the grand assortment of species I needed for a living herb wreath. Do you think the Home Depot at 59th St. would have the peanut seeds that I REQUIRED? No, but Henry Field's did and shipped them right out with great instructions printed on the pack. Racks of Renee's Seeds are often available in the city, but what I crave are the unusual, and for that I run right to the catalog, though Renee sometimes gives me free seeds to try. At High Country Gardens I found some great lavenders, yarrows and other xeric plants for those containers not on my drip system. A terrific bonus of a good catalog is the amount of valuable planting and growing information, so pay heed. Seeds, roses, perennials, herbs, shrubs, containers, fertilizers, and bagged compost all showed up in my building lobby, trucked there by UPS, FedEx, or USPS. I paid attention to the pot size and shipping dates so I'd know just what to expect and be available to plant immediately. that they'll catch up to landscape size in a year or two, Baker Creek Seeds for heirlooms, Pinetree for their mini-packs so she can try lots of new varieties before committing to a pack of 60-100 tomatoes, beets or carrots, and Johnny's from Maine where winter hardiness is a given. If I need to ponder which one of 32 varieties of sunflower to choose, from the largest to the smallest, I go straight to Johnny's. (below, biggest and smallest at the Korn King produce stand, Canterbury NH) If you want to check out other mailorder sources visit the Mailorder Gardening Association which lists members selling all categories of plants and garden stuff, phone numbers for paper catalogs, direct links to online sites, updated USDA hardiness map from 2003, and tips on how to handle your plants if you can't put them right in the ground. As I was exploring this site for today's post, I ran across Moss Acres; I had been hearing good things about them, had been meaning to try their mosses and now will, if not in New York, then in the shady garden of one of my kids. Enough of the cold. 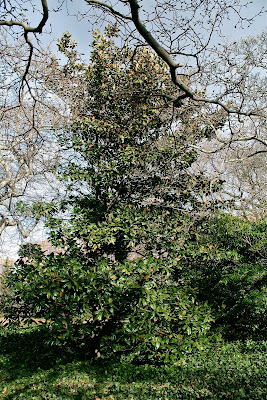 Let's talk about warm gardens in NYC. When the outside temperature was in the teens, I had the pleasure of exploring the vertical gardens at the new David Rubenstein Atrium at Lincoln Center. While classical music provided the sound track, I could snack at 'wichcraft cafe, use the WiFi service, admire a huge wall tapestry, or buy same-day discount tickets for LC performances including South Pacific. Currently, the Atrium is offering free live concerts on Thursday evenings. (Be careful; the box office is closed on Mondays though the Atrium stays open). I could also watch the floor to ceiling fountain, and even better, discover the patterns in the two vertical walls of plants, each 21' high by 34' wide planted with over two thousand tropicals. 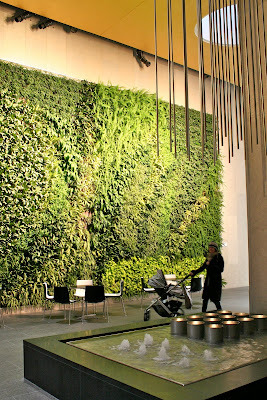 One of my first posts to this blog was about an outdoor vertical garden on E. 86th St. It looked great until building scaffolding went up blocking the light. It's been over a year now. The construction is still there; those plants are DEAD. the great shape it deserves. I don't do much outdoor gardening this time of year, for obvious reasons. But one of my best clients is coming back this weekend (after a month in warmer climes) and I wanted to make sure the garden looked neat, if not exactly welcoming. I wasn't sure what to expect. We've had snow and wind and rain and more wind, and I prepared for several hours of clean-up in below-freezing temperatures. What a wonderful surprise to step out onto the terrace and find a perfect winter scene. Subdued colors, obvious texture, fluid movement, defining structure. And there was warmth. Not physical warmth...remember the temperature was 20-something. But visual warmth. Maybe because the sun was out, maybe because we've passed the solstice and are undeniably heading toward spring. Or maybe it was all in my imagination.